Orthorhombic (anhydrous, chalcocyanite), space group Pnma, oP24, a = 0.839 nm, b = 0.669 nm, c = 0.483 nm. Copper (II) sulfate, also known as cupric sulfate, or copper sulphate, are inorganic compound with the chemical formula CuSO4(H2O)x, where x can range from 0 to 5. The pentahydrate (x = 5) is the most common form. Older names for this compound include blue vitriol, bluestone, vitriol of copper, and Roman vitriol. This salt exists as a series of compounds that differ in their degree of hydration. The anhydrous salt is a white powder in its pure form, whereas the pentahydrate (CuSO4·5H2O), the most commonly encountered salt, is bright blue. Copper (II) sulfate exothermically dissolves in water to give the aquo complex [Cu(H2O)6]2+, which has octahedral molecular geometry and is paramagnetic. Commercial copper sulfate is usually about 98% pure copper sulfate, and may contain traces of water. Anhydrous Copper sulfate is 39.81 percent copper and 60.19 percent sulfate by mass, and in its blue, hydrous form, it is 25.47% copper, 38.47% sulfate (12.82% sulfur) and 36.06% water by mass. Four types of crystal size are provided based on its usage: large crystals (10-40 mm), small crystals (2–10 mm), snow crystals (less than 2 mm), and windswept powder (less than 0.15 mm). Copper(II) sulfate pentahydrate decomposes before melting. It loses two water molecules upon heating at 63 °C (145 °F), followed by two more at 109 °C (228 °F) and the final water molecule at 200 °C (392 °F). Dehydration proceeds by decomposition of the tetraaquacopper(2+) moiety, two opposing aqua groups are lost to give a diaquacopper(2+) moiety. The second dehydration step occurs with the final two aqua groups are lost. Complete dehydration occurs when the only unbound water molecule is lost. At 650 °C (1,202 °F), copper (II) sulfate decomposes into copper (II) oxide (CuO) and sulfur trioxide (SO3). Copper sulfate pentahydrate is a fungicide. However, some fungi are capable of adapting to elevated levels of copper ions. By mixing a water solution of copper sulfate and a suspension of slaked lime one obtains the Bordeaux mixture, a suspension of copper(II) hydroxide Cu(OH)2 and calcium sulphate, which is used to control fungus on grapes, melons, and other berries. Another application is Cheshunt compound, a mixture of copper sulfate and ammonium carbonate used in horticulture to prevent damping off in seedlings. Its use as a herbicide is not agricultural, but instead to control invasive aquatic plants and the roots of plants that may be situated near pipes containing water. It is used in swimming pools as an algicide. A dilute solution of copper sulfate is used to treat aquarium fishes for parasitic infections, and is also used to remove snails from aquariums. 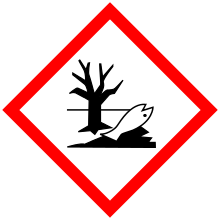 Copper ions are highly toxic to fish, so care must be taken with the dosage. Most species of algae can be controlled with very low concentrations of copper sulfate. Copper sulfate inhibits growth of bacteria such as Escherichia coli. Copper(II) sulfate has attracted many niche applications over the centuries. In industry copper sulfate has multiple applications. In printing it is an additive to book binding pastes and glues to protect paper from insect bites; in building it is an additive to concrete to provide water resistance and to make it antiseptic. Copper sulfate can be used as a coloring ingredient in artworks, especially glasses and potteries. Copper sulfate is also used in firework manufacture as a blue coloring agent, but it is not safe to mix copper sulfate with chlorates when mixing firework powders. Copper sulfate is used to test blood for anemia. The blood is tested by dropping it into a solution of copper sulfate of known specific gravity – blood which contains sufficient hemoglobin sinks rapidly due to its density, whereas blood which does not sink or sinks slowly has insufficient amount of hemoglobin. In high school and general chemistry education, copper sulfate is used as electrolyte for galvanic cells, usually as a cathode solution. For example, in a zinc/copper cell, copper ion in copper sulfate solution absorbs electron from zinc and forms metallic copper. Copper sulfate was used in the past as an emetic. It is now considered too toxic for this use. It is still listed as an antidote in the World Health Organization's Anatomical Therapeutic Chemical Classification System. Copper sulfate was once used to fight malaria. For example, during the 1940s in Trinidad, a malaria epidemic was caused by an increase of mosquito habitat in bromeliads growing on newly imported immortelle (Erythrina micropteryx) trees. The epidemic was controlled by spraying dilute copper sulfate solution into these epiphytes, killing them and removing the mosquito breeding grounds. Copper sulfate is used as a molluscicide to treat bilharzia in tropical countries. Cupric sulfate is also used to assist with the treatment of cutaneous phosphorus burns; however, it is not recommended for this purpose due to its toxicity. 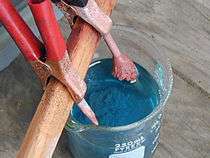 Copper sulfate is used to etch zinc or copper plates for intaglio printmaking. It is also used to etch designs into copper for jewelry, such as for Champlevé. Copper sulfate can be used as a mordant in vegetable dyeing. It often highlights the green tints of the specific dyes. The anhydrous form is a white solid. It can be produced by dehydration of the hydrate. It occurs as a rare mineral known as chalcocyanite. 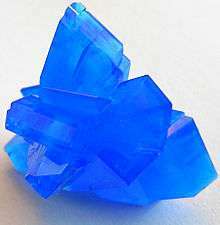 The hydrated copper sulfate also occurs in nature as chalcanthite (pentahydrate). Two other copper sulfates comprise the remaining of these rare minerals: bonattite (trihydrate) and boothite (heptahydrate). Upon oral exposure, copper sulfate is moderately toxic. According to studies, the lowest dose of copper sulfate that had a toxic impact on humans is 11 mg/kg. Because of its irritating effect on the gastrointestinal tract, vomiting is automatically triggered in case of the ingestion of copper sulfate. However, if copper sulfate is retained in the stomach, the symptoms can be severe. After 1–12 grams of copper sulfate are swallowed, such poisoning signs may occur as a metallic taste in the mouth, burning pain in the chest, nausea, diarrhea, vomiting, headache, discontinued urination, which leads to yellowing of the skin. In cases of copper sulfate poisoning, injury to the brain, stomach, liver, or kidneys may also occur. Copper sulfate is highly soluble in water and therefore is easy to distribute in the environment. Copper in the soil may be from industry, motor vehicle, and architectural materials. According to studies, copper sulfate exists mainly in the surface soil and tends to bind organic matter. The more acidic the soil is, the less binding occurs. ↑ Anthony, John W.; Bideaux, Richard A.; Bladh, Kenneth W.; Nichols, Monte C., eds. (2003). "Chalcocyanite". Handbook of Mineralogy (PDF). V. Borates, Carbonates, Sulfates. Chantilly, VA, US: Mineralogical Society of America. ISBN 0962209740. ↑ Kokkoros, P. A.; Rentzeperis, P. J. (1958). "The crystal structure of the anhydrous sulphates of copper and zinc". Acta Crystallographica. 11 (5): 361–364. doi:10.1107/S0365110X58000955. 1 2 3 "NIOSH Pocket Guide to Chemical Hazards #0150". National Institute for Occupational Safety and Health (NIOSH). ↑ Antoine-François de Fourcroy, tr. by Robert Heron (1796) "Elements of Chemistry, and Natural History: To which is Prefixed the Philosophy of Chemistry". J. Murray and others, Edinburgh. Page 348. 1 2 "Uses of Copper Compounds: Copper Sulphate". copper.org. Copper Development Association Inc. Retrieved 10 May 2015. ↑ Johnson, George Fiske (1935). "The Early History of Copper Fungicides". Agricultural History. 9 (2): 67–79. JSTOR 3739659. ↑ Parry, K. E.; Wood, R. K. S. (1958). "The adaption of fungi to fungicides: Adaption to copper and mercury salts". Annals of Applied Biology. 46 (3): 446. doi:10.1111/j.1744-7348.1958.tb02225.x. ↑ "Uses of Copper Compounds: Copper Sulfate's Role in Agriculture". Copper.org. doi:10.1111/j.1744-7348.1933.tb07770.x. Retrieved 2007-12-31. 1 2 Copper Development Association. "Uses of Copper Compounds: Table A - Uses of Copper Sulphate". copper. Copper Development Association Inc. Retrieved 12 May 2015. ↑ Holtzmann, N. A.; Haslam, R. H. (July 1968). "Elevation of serum copper following copper sulfate as an emetic". Pediatrics. 42 (1): 189–93. PMID 4385403. ↑ Barqouni, Loai; Abu Shaaban, Nafiz; Elessi, Khamis; Barqouni, Loai (2014). "Interventions for treating phosphorus burns". Cochrane Database of Systematic Reviews (6): CD008805. doi:10.1002/14651858.CD008805.pub3. Wikimedia Commons has media related to Copper(II) sulfate.